Jenn Kirby was the 2017 artist-in-residence. 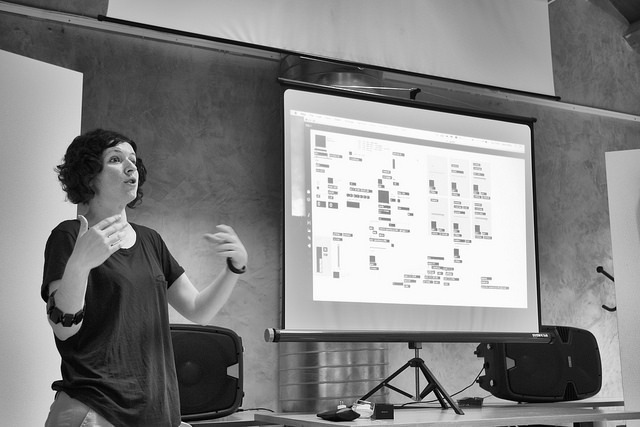 Her residency included curating a concert of music by Irish and Ireland-based composers, presenting lectures on “The Performance of Live Electronics” and “Celebrating Diversity in One’s Own Practice”, and delivering workshops and tutorials to the participants. The performers were participants of the festival and many had little prior experience with electronics. However, they had an openness to embrace new material and challenges – which is exactly the type of participant this festival attracts. The festival itself is very supportive, providing participants with 1-to-1 tutorials from its world-class faculty. Performers learn from composers and composers learn from performers through highly collaborative and exploratory workshops and seminars. Jenn delivered workshops and individual tutorials to introduce participants to the works of Irish composers and mentor participants on approaches for incorporating electronics into their own practices, as well as engaging in discussions on compositional practices, performance practices and life as an artist. There was significant rehearsal time allocated for this concert in the stunning auditorium in Maccagno. People arrive for the festival and are briefed Sunday evening. The festival begins at 8am Monday morning as do rehearsals. The concert is on Tuesday evening. Faculty, crew and participants work through jetlag with a commitment to the festival. Activities are scheduled from 8am to 11pm. The Irish residency is a significant component of the festival. There are no other concerts which focus on the music of a specific country, and with participants travelling to take part in the festival from all over the world, this provides an impact which may ripple on for years. The highlights of the festival for me where to be able to discuss technical and aesthetic implications around performing with live electronics and also discussing living as an artist. The festival hosts participants from all over the world and so discussing diversity in your own practice with such a diverse group was particularly special. The sharing of ideas works both ways, by presenting certain issues around instrument design and performance, we were able to share potential solutions in an open and inclusive manner. I want to thank the faculty and participants for their openness and thank you to AIC, CMC, soundSCAPE and Culture Ireland for creating and supporting this great residency. Use of controllers – taking sound and/or data from physical gestures and creating new sounds or processing sounds. I'm interested in all methods, but I am particularly drawn to creating and processing sounds through the use of physical gesture. My goal is to find ways of creating gestures that will produce sounds electronically in the same musically meaningful way that a performer produces sound from an instrument. Use of a click track – often used when mixing a tape part with an instrumental part. Visual source of electronics - does it just come out the speakers? Are computers hidden? Are performers hidden? Wearing controllers - what movements will they track? Is it comfortable for the performer? Does the performer control the controller or is it passively tracking movement? Knowing how it is supposed to sound - if sounds are being processed, the type and position of the microphone, the technique of performing, the acoustics of the room and many other factors can influence the resulting sound. If the desired sound is unknown this can be quite difficult to rehearse. A suggestion here would be to provide an example sound file. My talk on this demonstrated different software instruments, approaches from performers and composers, and invited soundSCAPE participants to play some instruments I had developed. Playing these instruments allows the participant to get a sense of the performability of the instrument and the relationship between movement and sound. Probably more importantly, it illustrates that they are instruments that need to be played; there is a level of control and skill that must be acquired through practice, similar to a 'real' instrument. 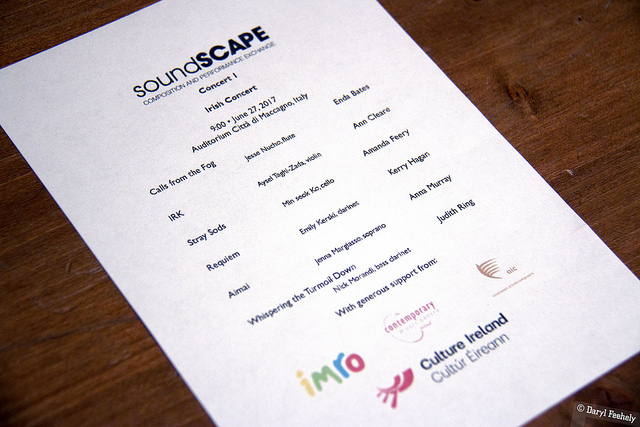 Although participants go to soundSCAPE as a composer or a performer, many are both. Many are also sound artists, curators, teachers, etc. Rather than be encouraged to choose one path, my suggestion is to do everything that interests you. Make whatever music you feel a desire to make. When we free ourselves of the labels of having to identify as a composer of X music, I believe we can be more creative, more ambitious and more satisfied with our output. I am not concerned with being called a composer, sound artist or performer. I consider myself all of these things. My compositional practices include, noise music, electronic music, sound art, contemporary instrumental music, sound design for theatre and dance, laptop orchestras and solo live electronics. My non-compositional practices mainly consist of: lecturing, performing and co-organising concerts. If you find yourself wanting to write text for a soprano, but stop because you are not a writer or poet, you have denied yourself the opportunity to become one. Don’t judge yourself before you have even begun. Instead, congratulate yourself, for you are now a poet! This is not only an issue of labels, but also openness. You’d be surprised what you can do, when you allow yourself to do it. Every time I hear myself say I should be doing this, or this should be that way, I stop and ask myself who says ‘this should be that’? This is most often a criticism of one's self; I should be able to deal with this, or I should be composing this instead of that, I should be writing longer pieces, or shorter pieces, etc. Question where this 'should' believe comes from. A conditioning on what we are to expect from the world, ourselves or others. If you use the word ‘should’ to stop you from doing something, ask why. If your ‘why’ yields an unsatisfactory answer, then ignore it and move on. Being diverse does not mean doing everything and anything. It is more about the freedom to prioritise what you want to do; doing all the things you want to do and not doing what you do not want to do, but feel you ought to do. We often say we will do something when we have more time. The truth is, you're never going to have more time. If you want to do something, you have to make time for it. You choose how to spend your day. You choose what to put into your day and what takes up your time. It may or not be the case that want to do so much that it will not fit into 24hrs. If this is the case, then you must prioritise, starting of course with the essentials. What is important to one person may not be too another, so it is important that you think about these carefully. I know a good night’s sleep is important to me and I'll rarely compromise on it. Once you have prioritized, you know your goals and then you can start saying no to things. No to the things that are not in line with your current goals. Since we are malleable and flexible, what we think and how we feel today may not be the same next year or even tomorrow, so checking your current goals is important. Having a flexibility around your goals and allowing yourself to change your mind will ensure you create the right path for yourself and keeping making the music you want to make.